Jason recaps the events from Roll For Combat, Episode 016: Straight Outta (John) Compton. I want to spend most of my time talking about John Compton’s brief-but-memorable stint playing the Goblin-Twins, Zan and Jayna… oh wait, Lursk and Torsa. But I did want to pull out one brief section from the “interview” portion of the show – the thread about evil characters. There’s no compelling reason or character motivation for it. The evil character isn’t doing it to advance any sort of plan or agenda. They’re basically just peeing in the punchbowl because… “I’m EEEEEEEEVIL!” (feel free to imaging shining a flashlight under your chin to appear more ominous when saying it). At that point, it becomes one player putting his or her fun in front of everyone else’s, and it can end up wasting everyone’s time. Full disclosure: this was my too-cool-for-it daughter, the one time she agreed to sit down and play with us, so I know this pain all too well. But let’s get to Dr. Compton’s Roleplaying 101. That was unexpected. Fun, certainly. But unexpected. Steve had mentioned before the episode that we’d be having a special guest – he doesn’t necessarily tell us who it is or what they’ll be doing, but he wants us to put pants on and use our inside voices when we have guests. And based on the fact that there weren’t really any other NPCs around, the fact that John Compton would be playing the goblins wasn’t too hard to piece together. But dammmmn John dialed it up to 11 with the roleplaying, didn’t he? I don’t know if you can tell from the podcast, but on a couple of occasions, I was legitimately flustered and at a loss for words. That did NOT go as expected. In a good way. I will concede that part of it is I’m just not that heavy of a roleplayer. I come up with a general backstory and an idea of how my character will think and react to situations, and I try to color inside the lines when making decisions, but I have to admit I don’t really get deep into “being” Tuttle. In short – no voices. But after “watching” John’s performance, I’m kind of inspired to up my roleplaying game. What was really impressive to me is that that he squeezed so much out of what ought to have been two fairly minor characters. You hear “goblins”, and you figure they’re fairly cannon-fodder-y and aren’t going to have any real weight to them – they’re basically something there to fight or negotiate with and move on to the next thing. Somehow John managed to bring them to life in a way I would never have expected. The other reason I was a little flustered was the central dilemma of the session: whether to let the goblins “operate” on CHDRR or not. You see, from a fully logical roleplaying standpoint, I recognized it was the “wrong” roleplaying choice to let the goblins help reassemble CHDRR. I’ve been portraying Tuttle as both protective of his technology and aloof toward people he holds as lesser than himself. If Tuttle is going to “collaborate” with someone, it’s going to be other dudes in lab coats, not these guys. The idea that Tuttle would say “sure, go ahead, muck around in there” – in general, much less to a pair of goblins he never met before – strains credibility. “Defense will stipulate”, as the courtroom dramas are fond of saying. So why did I say yes? First, let me explain the inside joke about chainsaws. In our Iron Gods campaign, I play a warpriest (Ezrik) who worships Gorum – if you think “Klingon warrior”, you’re not too far off the mark. Qapla’! Since Iron Gods is a tech-flavored campaign (in some ways, it’s almost Starfinder’s father or sibling or disreputable uncle who spends all his time at the dog track), Ezrik picked up a chainsaw as his primary weapon somewhere in his travels. So when Steve mentions that I love chainsaws… he knows me, man! But back to this campaign. The first reason I said yes is purely selfish – it was a little bit gratifying to the ego to have one of the bigwigs at Paizo personally give my character a facelift. The idea that CHDRR gets to become to be this custom creation, unique within the Starfinder multiverse, and I get the keys? That’s pretty freakin’ cool. It may not be “Tuttle Blacktail Funko Pop!” levels of cool (someday…), but it’s definitely somewhere on the Continuum of Coolness. I’ll grant those bragging rights are totally useless in a gaming sense – to steal one of the Ferengi Rules of Acquisition, “bragging rights and an empty sack is worth the sack” – but I’m pretty intrigued to see where this goes. The one gameplay reason I agreed to do it is that they said the magic word… literally and figuratively. Magic. The goblins did drop a few mentions of having magic powers – is one of them a mystic, maybe? – and our team has NO access to magic at this time. So I thought maybe if their tinkerings gave us access to some magic abilities, maybe it was worth the risk to add something new to the toolbox. But I think the most compelling reason is that sometimes you just have to say “yes” to the thing that’s going to create interesting story moments. Because at the end of the day, this is supposed to be fun, and even if it breaks character just a little bit, maybe the entertainment value is worth it. 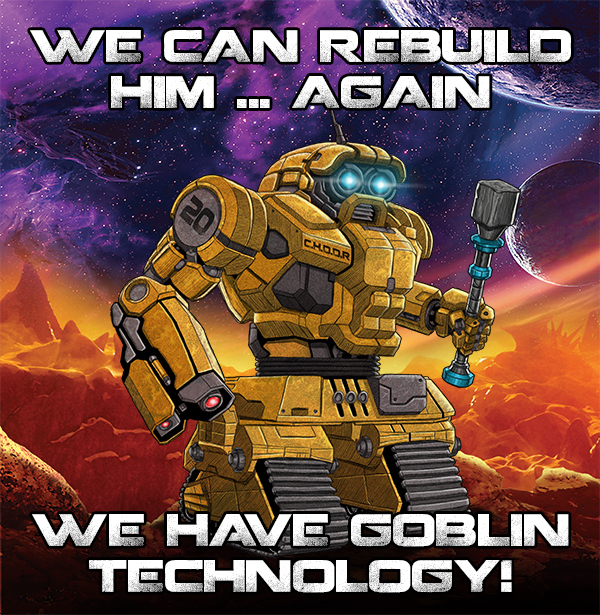 Are the goblins going to make CHDRR turn on us? Will he blow up the first time Tuttle tries to issue commands? Will they make him extra-awesome and CHDRR will become the most valuable member of the party? (Some would say he already is.) These are much more interesting questions and may create more enduring story moments than just fighting the goblins or keeping them locked in the room they were in for the rest of the trip. If the price of admission to that particular carnival ride is that Tuttle has to break character and lean into implausible ideas about “exchanging knowledge” with goblins? So be it. Also, there’s also the cowardly-but-true answer: if they REALLY screw CHDRR up, I assume I can probably go back and rebuild him to factory specs. Don’t think I wasn’t thinking that even as the word “sure” was leaving my mouth. So join us next week when we find out what sort of Frankenstein creation the Goblin-Twins come up with, and we further unravel the mysteries of the Driftrock. Any items on your wishlist for CHDRR 3.0? Have any experiences with roleplaying “evil” players in your personal games? Want Lursk and Torsa to have their own show? (Not sure we can arrange that, but I understand the sentiment…) Feel free to give us a holler on social media and join the conversation.